How do you fancy earning some money while you play a videogame? With the rise of Let’s Players and livestreaming it has become the dream of many. But only a few are able to pull it off, able to devote the time and effort needed to turn a hobby into a full-time job. Luckily, Hammercoin is here to help along – while it won’t make you a fortune, it goes a little towards turning gameplay time into dosh. Hammercoin is an online roguelike that pays homage to classics like The Legend of Zelda and Diablo. 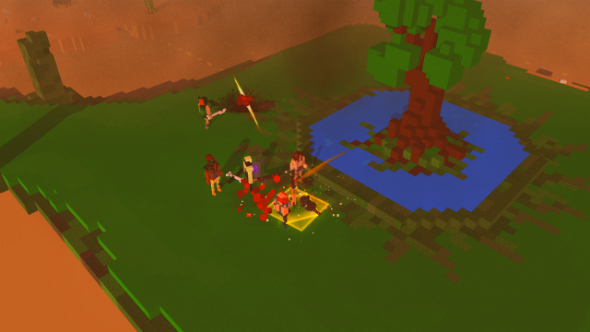 It’s made out of chunky, colourful voxels to evoke that jovial retro style, while also providing a proper hack-and-slash experience. But the feature that makes it stand out is its integration with Bitcoin. What that means is, when you start the game, you have your own Bitcoin wallet that enables microtransactions between you and the market bots in the game. Fight your way through dungeons, collect some loot, and then you can trade it in. You’ve done that in loads of other games, sure, but with Hammercoin you can actually cash in the money you earn in-game as Bitcoin and use it to buy things in reality. What do you say, then? You can purchase Hammercoin in its early access state right now or you can enter our competition to win one of 100 keys for the game.All you need to do is enter via our widget below. Every action you complete is worth one entry into the giveaway, and the more actions you complete the more chance you’ll have of winning. We’ll also need your email address so we can send you a code upon winning – we won’t send you spam, we promise!